All those morning Starbucks you indulge in can really begin to burn a hole in your pocket, not to mention the ozone layer. However, if you really can’t function without your morning coffee, then a reusable coffee cup is the perfect way to take your hot drinks on the go, whether they're home-brewed or from a coffee shop. When picking a coffee cup it’s mostly down to personal style preference, however the main things you may want to consider are the size: are you a venti or a tall kind of person? And is it insulated? If you’ve got a long drive there’s nothing worse than your coffee going cold before you’ve drunk it all, so look out for insulated travel mugs to keep your coffee hotter for longer. Check out our roundup below to see what’s right for you. This reusable coffee cup is made from glass with a cork ring around the centre which makes it easy to hold without scalding yourself. It’s not insulated, but glass has very effective thermal properties anyway. It is surprisingly durable, so you can expect it to fare well on your travels, and you can even pop it on the top shelf of the dishwasher for a quick and easy clean. This Hydro Flask could make the ideal companion if you’re an active person. Whether you're taking it on an early morning stroll or your commute to work, this reusable coffee cup is very versatile and has insulation that will keep drinks hot for up to 12 hours, or cold for up to 24 hours. It has a flip lid opening which means you won’t find it easy to spill and you can chuck it in your bag if needed. If you want something you can rely on every day, this shatterproof stainless steel reusable coffee cup should serve you well. It has a double-walled vacuum which keeps drinks hot for up to 2 hours and can hold cold drinks just as well. The range of colours makes this a popular choice of reusable coffee cup (you will be using it every day after all), and it has a sealed lid to keep things secure. This slightly larger glass coffee cup is designed to fit a standard barista serving, so you can take it to your local Starbucks or Costa and order your usual without the extra side of guilt that comes with a disposable cup. It’s dishwasher and microwave safe, with an anti-splash silicone lid and sleeve to make it easy to carry. One of the more expensive options, but definitely worth it, and it comes in a range of colours! Some of the reusable coffee cups on the market can be a bit cumbersome to say the least. 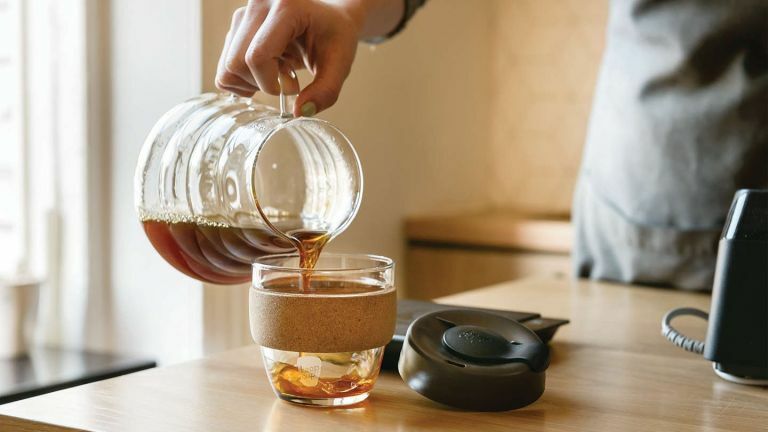 If you really don’t have the space to be lugging it around all day after you’ve finished your drink, then this collapsible coffee cup could solve your problem. It’s made from recyclable materials and is dishwasher safe for easy maintenance. Users have said it's small enough to fit in your pocket when collapsed, and the lid is said to be completely leak-proof! This large thermal mug from Kate Spade is both stylish and functional for even the biggest caff-fiend. It can hold up to 450ml of liquid, so whether you like an iced latte or a strong hot coffee, you’ll have no trouble fitting it into this reusable coffee cup. It comes complete with lid to stop spillages and to keep coffee hotter for longer. Eco-warriors will love this brightly coloured coffee cup made from natural bamboo fibres. It’s completely biodegradable and naturally sterile so it doesn’t cling on to flavours. The silicone lid and holder make it easy to carry and drink from, and it's dishwasher safe and thus easy to clean, however reviewers have said you'll need to give it a scrub if you’ve left coffee in it for some time.